In Part 1, we looked at the difficult feelings that can surface when you see other people who still have his or her partner. It’s natural to feel some envy, anger and resentment when you see other couples. These reactions represent the difficult emotional shift you’re making from having been part of a couple to now being single. You may imagine that if you had a second chance at having your late partner with you again, you would do things differently. In reality, even if you could do it all over again, there would always be some tensions and conflicts. That’s just a normal part of being together with anyone. Give yourself permission to yearn for what others still have but remind yourself of some of the realities that you once struggled with during your relationship with your late partner. Having lost your own spouse/partner, you may find yourself noticing couples everywhere: holding hands, arguing, or just being able to share life’s experiences together. As you grapple with adjusting to a sense of yourself without a partner, you may discover difficult feelings surfacing when you’re around couples. You might feel somewhat guilty about the envy you experience in these situations. Such a reaction is normal and very understandable. Many become angry and resentful when the pain of his or her loss is stirred up by seeing other couples’ fighting or bickering over what appears to be petty problems. We’ll discuss more about this in Part 2. This information is by Sandi Duffy, a widowed mom with young children. We’re impressed by the sound advice Sandi offers in Financial Planning for Widowed Moms. According to Sandi,"Once the funeral is over, you are left to pick up the pieces of your life and your children's lives. How are you going to do this? Where do you even start? It's a cold hard fact that you need money to live, pay the bills, feed your children, etc. The first and most important thing you can do for yourself and your children is to gather all your late husband's assets, bank accounts, retirement funds, life insurance, etc. and get yourself to a certified financial planner. I cannot emphasize enough the word Certified Financial Planner. Not a friend of a friend of a friend who claims to be good with money. I had a colleague at work tell me she is really good with finances and would do mine. Really? Would she be able to tell me how to invest my money, so that I can draw an income from it every month? Would she be able to project how much college will cost in 18 years and then advise me how to invest, so that I can fund my children's educations? Go to a real certified financial planner, someone who is highly recommended by more than one person. If you are unsure, interview a few of them. I spoke to three before I chose the one I am currently using. The next most important thing is to find a good lawyer who specializes in wills and trusts. Again, find one who specializes in wills and trusts. My husband and I used a real estate attorney to do our wills, living wills, and durable power of attorney (POA). Thankfully we didn't have to use the POA because when I went to a lawyer who specializes in this, he told me it was all wrong and never would have been honored. This is critical if you have young children. I have a trust set up that in the event of my death, the children receive one quarter of my estate at 25, one quarter at 30 and the remaining balance at 35. It names who will become their guardians and who will control the money they inherit. Also, the amount of paperwork dealing with your spouse's estate that has to be filed with the IRS is daunting. Let an attorney handle it all. I know it seems cold, but you really need to take care of the financial part of your spouse's death. It's also a good distraction. I recommend two books that specifically deal with financial issues for women: David Bach's Smart Women Finish Rich and Suze Orman's Women and Money." Sandi goes on to say," 'They' say not to make any big decisions for a year. That's probably a good idea. If financially you can keep your house, keep it. I couldn't even think about packing up my house, showing it to strangers, uprooting my kids, finding new childcare...the list is endless. If you don't need to make more money, don't switch jobs. I remember calling my former boss for a letter of reference, thinking I needed to make more money for our family. She grudgingly wrote the letter, not because she had negative feelings towards me, but she didn't think it was a good idea for me to make a change so soon. I remember her telling me she would write it, but hoped I would be calling her in a few years to update it because I didn't use the first one. She was right. I kept my job. Changing jobs, moving, and losing a spouse (through divorce or death) are the three biggest stressors. Try to deal with just one at a time." Sandi Duffy was widowed in October 2007 when her 44-year-old husband succumbed to Pancreatic Cancer. In Part 1 of this topic, we looked at how isolated and different you can feel by not having anyone your own age who can truly understand your bereavement experience. - Although your friends may not be able to relate emotionally to what you’re going through, they can help in other ways. Try suggesting some specific tasks or chores they can assist with. - Check out online resources, such as GriefNet.org, for specialized support groups for young widowed (GriefNet’s online groups are monitored by a clinical psychologist). The Dougy Centers (dougy.org), while offering groups for children, also provide or can refer you to groups for the young widowed. 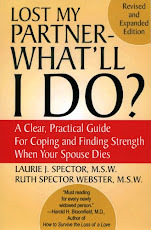 - Be sure to look for “widowed” groups, which are specifically for those who have lost a spouse/partner. “Bereavement” groups usually include those who have suffered other types of loss, such as a parent or child. - Don’t reject a widowed group with older people. Even with age differences, members can have some useful perspectives to offer. - Check your local newspaper community listings for widowed groups in your area. Or contact the Social Services Department of your local hospital/hospices for referrals. REMEMBER: Give yourself lots of time to process everything that’s hit you. You’re still young and your spouse/partner has died. Not when your dreams and plans for the future were based on the assumption there would be many more years ahead. Suddenly you have to juggle financial issues. And, if you’re a parent, your children’s emotional and physical needs. On top of all that, being widowed young can leave you feeling isolated and different. a) Odds are, none of your friends or most people your age can relate to what you’re now going through. Those who have been divorced may tell you they can understand the pain and anxiety you’re experiencing, but they don’t realize there’s a big difference between losing a partner to divorce and having a partner die. Death is final. Their former partner is still alive somewhere. b) There’s the expectation from others (and maybe yourself), that because your loss has occurred early in life, you can bounce back more quickly than an older survivor. This may result in well-meaning family and friends urging you to “get on with your life” and pressure you about dating before you’re ready. In Part 2, we’ll offer six proven tips for handling the problem of isolation. In Part 1 of this excerpt from Lost My Partner – What’ll I Do? we discussed the various ways your coworkers may react to you once you return to work. We now focus on your own reactions to being on the job following your loss. - Be prepared for unexpected tears. During the first week at work, there may be moments when you find yourself tearful. This lessens with time, but for now, give yourself permission to retreat to the restroom or other secluded area for a good cry or to compose yourself. Many find giving themselves this release helps relieve the pressure of having to control feelings of grief while at work. - Be prepared to experience some difficulty with memory and concentration. These are common but temporary grief reactions. While you may feel frustrated and anxious about this change, try to be patient with yourself. It helps to reread and/or go over information or tasks more than once. - Your boss or coworkers may have unrealistic expectations. Assure them you’re doing your best, and that any slowdown on your part is temporary. Despite how others may react, it’s important for you to recognize that what is going on is normal and temporary. With time and patience (especially your own), you will regain the capacity you used to have to do your job. Returning to a job after a spouse’s death is a step that tends to be anticipated with eagerness, dread, or both, at different times. The workplace can seem like a familiar well-ordered refuge where you find many hours of distraction away from your pain. On the other hand, it can represent the ordeal of work pressures, coworkers’ reactions, and a boss’s unrealistic expectations. - While your private world has been drastically changed, your workplace has gone along in its usual way. You may, therefore, initially feel out of sync with the rest of your coworkers. - Coworkers will look to you for their cues. Others usually feel awkward about expressing feelings or knowing the “right thing” to say. How you respond to the first expressions of sympathy will convey a message to other coworkers about how and if you want to discuss the loss. Some possible responses include: “Thank you. It’s difficult to talk right now – maybe later.” Or “I appreciate your concern.” Remember, the choice is yours. - Some coworkers may not mention the loss. This can feel hurtful and even insulting. Try to keep in mind that people are often afraid of “reminding” or upsetting a grieving person. Expressing sadness can seem especially threatening in a work setting, where personal distress is supposed to take a back seat to the demands of business.